﻿Smart ﻿Screen ﻿is ﻿a ﻿real ﻿working ﻿animated ﻿screen ﻿in ﻿miniature ﻿which ﻿you ﻿can ﻿customise ﻿with ﻿your ﻿own ﻿messages ﻿in ﻿any ﻿language ﻿(using ﻿the ﻿latin ﻿alphabet) ﻿to ﻿really ﻿bring ﻿your ﻿layout ﻿to ﻿life! ﻿The ﻿small ﻿display ﻿module ﻿has ﻿everything ﻿built ﻿inside ﻿so ﻿you ﻿only ﻿need ﻿to ﻿connect ﻿2 ﻿wires ﻿to ﻿DC ﻿or ﻿DCC ﻿power ﻿to ﻿make ﻿it ﻿work. ﻿The ﻿Smart ﻿Screen ﻿can ﻿display ﻿10 ﻿screens ﻿which ﻿can ﻿be ﻿triggered ﻿by ﻿a ﻿range ﻿of ﻿different ﻿inputs ﻿including ﻿switches, ﻿DCC ﻿commands ﻿and ﻿track ﻿sensors ﻿which ﻿can ﻿be ﻿used ﻿to ﻿show ﻿a ﻿different ﻿screen ﻿as ﻿a ﻿train ﻿passes ﻿over ﻿it.... ﻿For ﻿example: ﻿“Platform ﻿1: ﻿MyTown”, ﻿then ﻿change ﻿to ﻿“Train ﻿arriving” ﻿or ﻿the ﻿text“Train ﻿delayed” ﻿can ﻿scroll ﻿through ﻿the ﻿display, ﻿etc. ﻿The ﻿clock ﻿can ﻿be ﻿static, ﻿but ﻿you ﻿can ﻿also ﻿choose ﻿to ﻿display ﻿a ﻿real ﻿working ﻿clock. ﻿Everything ﻿is ﻿contained ﻿in ﻿the ﻿Smart ﻿Screen ﻿so ﻿no ﻿complicated ﻿wiring ﻿or ﻿circuit ﻿boards ﻿- ﻿just ﻿connect ﻿2 ﻿wires ﻿to ﻿a ﻿power ﻿source ﻿and ﻿go. ﻿Mounting ﻿a ﻿Smart ﻿Screen ﻿on ﻿a ﻿platform ﻿or ﻿in ﻿a ﻿station ﻿can ﻿add ﻿a ﻿lot ﻿of ﻿realism. ﻿You ﻿can ﻿change ﻿what ﻿the ﻿display ﻿is ﻿showing ﻿at ﻿the ﻿touch ﻿of ﻿a ﻿button. ﻿Or ﻿if ﻿you ﻿fit ﻿one ﻿or ﻿two ﻿sensors ﻿next ﻿to ﻿your ﻿tracks, ﻿it ﻿can ﻿show ﻿appropriate ﻿messages ﻿for ﻿trains ﻿arriving ﻿or ﻿departing ﻿completely ﻿automatically. ﻿If ﻿your ﻿layout ﻿is ﻿DCC ﻿you ﻿can ﻿automatically ﻿display ﻿different ﻿screens ﻿for ﻿the ﻿various ﻿routes ﻿your ﻿points ﻿are ﻿set ﻿to ﻿as ﻿trains ﻿leave ﻿the ﻿station...... ﻿the ﻿possibilities ﻿are ﻿almost ﻿endless. ﻿One ﻿of ﻿the ﻿most ﻿exciting ﻿things ﻿about ﻿the ﻿Smart ﻿Screen ﻿is, ﻿besides ﻿its ﻿incredibly ﻿small ﻿size, ﻿the ﻿scrolling ﻿text. ﻿This ﻿really ﻿gets ﻿the ﻿attention ﻿and ﻿shows ﻿that ﻿you ﻿are ﻿not ﻿only ﻿displaying ﻿a ﻿static, ﻿printed ﻿image. ﻿Sometimes ﻿you ﻿may ﻿want ﻿to ﻿display ﻿several ﻿words ﻿or ﻿list ﻿the ﻿various ﻿stations ﻿your ﻿train ﻿is ﻿stopping ﻿at, ﻿but ﻿they ﻿wouldn’t ﻿normally ﻿fit ﻿on ﻿the ﻿screen. ﻿Smart ﻿Screen ﻿is ﻿able ﻿to ﻿display ﻿long ﻿messages ﻿on ﻿each ﻿of ﻿the ﻿10 ﻿customisable ﻿displays, ﻿by ﻿scrolling ﻿them ﻿along ﻿the ﻿screen ﻿automatically.... ﻿just ﻿like ﻿the ﻿real ﻿thing! ﻿As ﻿well ﻿as ﻿mounting ﻿your ﻿Smart ﻿Screen ﻿on ﻿the ﻿station ﻿you ﻿can ﻿also ﻿fit ﻿it ﻿inside ﻿a ﻿train. 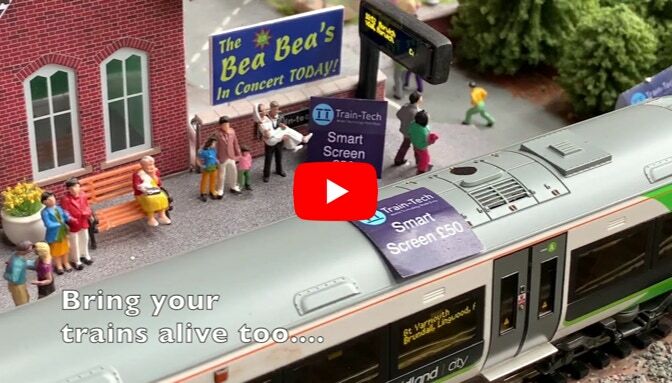 ﻿You ﻿can ﻿just ﻿connect ﻿it ﻿to ﻿a ﻿regular ﻿DC ﻿power ﻿feed ﻿to ﻿light ﻿it ﻿up, ﻿or ﻿if ﻿you ﻿are ﻿running ﻿your ﻿locomotives ﻿on ﻿DCC, ﻿the ﻿Smart ﻿Screen ﻿has ﻿a ﻿built-in ﻿digital ﻿decoder ﻿which ﻿can ﻿be ﻿set ﻿to ﻿monitor ﻿the ﻿train ﻿direction ﻿and ﻿display ﻿a ﻿different ﻿destination ﻿or ﻿message ﻿automatically ﻿depending ﻿on ﻿its ﻿direction ﻿of ﻿travel. ﻿Displays ﻿are ﻿now ﻿part ﻿of ﻿everyday ﻿life, ﻿so ﻿Smart ﻿Screens ﻿can ﻿be ﻿used ﻿on ﻿your ﻿layout ﻿in ﻿places ﻿other ﻿than ﻿trains ﻿and ﻿stations. ﻿They ﻿can ﻿help ﻿bring ﻿roads ﻿to ﻿life ﻿with ﻿changing ﻿screens ﻿and ﻿if ﻿you ﻿have ﻿a ﻿Faller ﻿Car ﻿system ﻿or ﻿similar ﻿you ﻿can ﻿automate ﻿the ﻿screens ﻿using ﻿magnetic ﻿reed ﻿switches ﻿under ﻿the ﻿road. ﻿You ﻿could ﻿also ﻿fit ﻿them ﻿in ﻿buses ﻿or ﻿bus ﻿stops, ﻿or ﻿use ﻿them ﻿in ﻿a ﻿Stadium ﻿to ﻿make ﻿your ﻿dream ﻿team ﻿scores ﻿come ﻿true. ﻿Smart ﻿Screens ﻿come ﻿preloaded ﻿with ﻿a ﻿demo ﻿display, ﻿but ﻿from ﻿the ﻿start ﻿you ﻿can ﻿fully ﻿customise ﻿your ﻿own ﻿messages. ﻿The ﻿clear ﻿instruction ﻿booklet ﻿(pdf ﻿download) ﻿will ﻿guide ﻿you ﻿step ﻿by ﻿step. ﻿Although ﻿once ﻿set ﻿up ﻿the ﻿screen ﻿can ﻿be ﻿powered ﻿from ﻿DCC ﻿or ﻿DC, ﻿you ﻿need ﻿to ﻿use ﻿a ﻿DCC ﻿controller ﻿to ﻿set ﻿up ﻿your ﻿own ﻿screens ﻿and ﻿inputs. ﻿This ﻿is ﻿fully ﻿explained ﻿in ﻿the ﻿instructions ﻿and ﻿most ﻿DCC ﻿controllers ﻿will ﻿work, ﻿although ﻿controllers ﻿with ﻿easy ﻿to ﻿use ﻿function ﻿commands ﻿are ﻿best. ﻿And ﻿if ﻿you ﻿need ﻿any ﻿help, ﻿you ﻿can ﻿always ﻿contact ﻿the ﻿Tramfabriek ﻿and ﻿you’ll ﻿be ﻿helped ﻿as ﻿soon ﻿as ﻿possible. ﻿- ﻿Smart ﻿Screens ﻿can ﻿either ﻿be ﻿powered ﻿directly ﻿from ﻿8-16 ﻿volts ﻿smooth ﻿DC ﻿or ﻿from ﻿DCC.